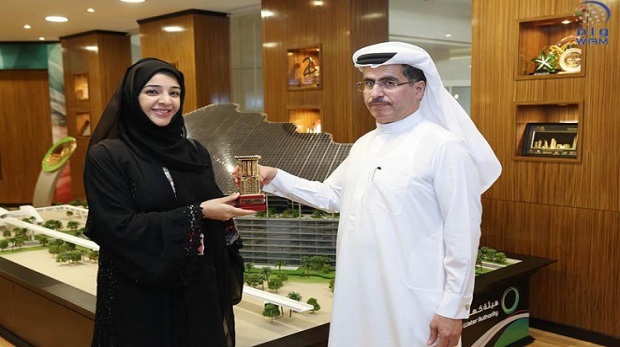 Preparations for Dubai Expo 2020 discussed. Reem Al Hashimy, Minister of State for International Cooperation and Director-General for the Dubai Expo 2020 Bureau, met Saeed Mohammed Al Tayer, Managing Director and CEO of Dubai Electricity and Water Authority (DEWA), at the Head Office of DEWA, to look at how DEWA can help Expo with its expertise and world-class services. During the meeting, the two parties conducted a comprehensive review of Dubai’s preparations to host the Dubai Expo 2020. Al Tayer confirmed to Al Hashimy that DEWA is prepared to provide full support to Dubai’s hosting the best World Expo that the world has ever seen. This supports the vision of His Highness Sheikh Mohammed bin Rashid Al Maktoum, Vice President and Prime Minister of the UAE and Ruler of Dubai. Al Hashimy thanked DEWA for its efforts. "I would like to express my gratitude to DEWA for their support of Expo 2020 Dubai as we seek to deliver a truly exceptional mega-event Their ongoing commitment to providing the people of the UAE with world-class services and meeting the highest international standards is aligned with the UAE’s continuing drive towards the adoption of clean energy sources, and our own ambitions for Expo 2020 Dubai, where 50 percent of the energy used on site over the six months of the event will be generated from renewable sources," she said. "As we progress according to plan to host an exceptional Expo that will be a source of pride for all and establish a legacy benefit future generations; this would not be possible without concerted efforts of all government entities and the public support, in line with the Expo’s theme, ‘Connecting Minds, Creating the Future," added Al Hashimy. The parties also discussed the progress of infrastructure and construction, in preparation for Dubai Expo 2020, which will include three 132/11 kilovolt (kV) substations with 45 kilometres (km) of high-voltage (132kV) cables. The total cost of the electricity projects will be Dh420 million. DEWA is also building water-transmission networks with pipelines that are 600 and 1,200 mm in diameter, pumping stations and distribution stations. With a planned budget of AED 515 million, these projects will increase water-flow rates and ensure an adequate water supply to meet the increasing demands. Expo 2020 will be connected to Mohammed bin Rashid Al Maktoum Solar Park, where the park will contribute to Expo’s power needs by proving 200MW of clean energy. The Park’s substations will be operational by 2017, and are named after the three sub-themes of Expo 2020, namely Sustainability, Mobility and Opportunity. DEWA is working to establish an excellent energy infrastructure that meets the emirate’s development needs. DEWA has launched a wide variety of initiatives to support this, allocating over Dh2.6 billion to boost electricity, water, and renewable energy projects, to the highest international standards. This contributes to the organisation of the World Expo 2020 in Dubai, which will display to the world our excellent public services, and focus on exploring clean and renewable energy. You are receiving this Newsletter because you have subscribed for our newsletter at our site. If you do not wish to receive further news or mailings fromwww.uaefreezones.com click here to unsubscribe.